With July 4th fast approaching, I know many of you will be spending the upcoming holiday around the family barbecue, on the water, or perhaps in the mountains. Those of us who live in the Wenatchee area have a great recreational opportunity just outside our doorsteps. Saddle Rock, owned by the city of Wenatchee and operated as a park, is an iconic location for outdoor recreation. It offers year-round fun for thousands of individuals and families. Its improved trailhead has made this area more accessible and popular. The increased activity will require an improved trail design and maintenance. 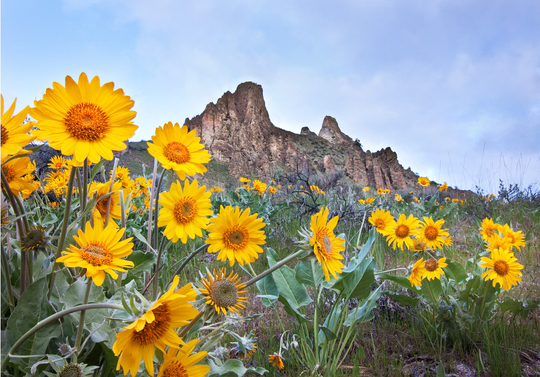 Balsomroot wildflowers at Saddle Rock welcome hikers each spring. This beautiful photo was provided by Peter Bauer Photography. During my 12th District listening tour last fall, the Chelan-Douglas Land Trust shared with me its plans to improve the Saddle Rock trail system, including creating an emergency access path and a smoother trail. The first step was long-awaited state grant dollars for soil remediation. With help from Wenatchee Mayor Frank Kuntz, Land Trust Executive Director Curt Soper, and state Representative Mike Steele, we secured funding in the supplemental capital budget for this soil work so that the trail enhancements could begin. The work is needed because several metals from old mining sites above and behind Saddle Rock have resulted in elevated levels of arsenic in the ground below. Public health risk is minimal for hiking the trail as is, but rebuilding the whole trail system would require ground-disturbing work. In accordance with state law, conducting this type of work where these materials are located first requires soil remediation. Over the next several months, the city of Wenatchee will be awarding contracts to complete the soil remediation and removal work. Once the city’s project is completed, the Land Trust and its team of volunteers will complete its long-planned trail redesign. Just like a home remodel or road improvement project, things sometimes seem worse before they get better, but I know that an improved Saddle Rock will be better for us all – and soon better than ever. Having this iconic landmark in Wenatchee’s ownership is a great thing, and I am very thankful to the city, Land Trust, and Representative Steele for working with me to secure funding for the project. Good things happen when we keep in communication, coordinate our advocacy, and work together. Let’s continue to keep Saddle Rock a location that all can enjoy…for current and future generations! 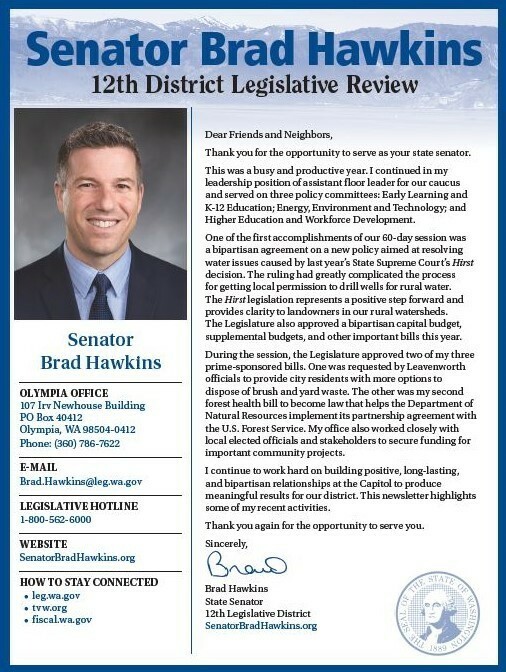 The approved funding for Saddle Rock was just one of several stories featured in my 12th District Legislative Review newsletter, which was recently mailed to households throughout the district. If you did not receive my printed newsletter in the mail, or if you received it but didn’t get a chance to read it, we have made it available online. Click here to view it. I appreciate the privilege and opportunity to serve as our state senator. Have a fun and safe holiday.